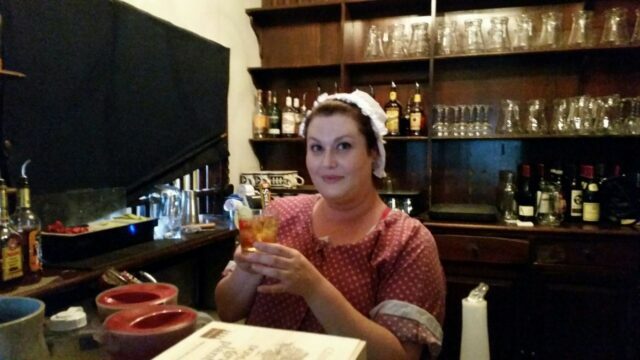 When you hoist a pint of Dear Old Mum at Chowning’s Tavern on Gloucester Street in Colonial Williamsburg, you’re renewing a tradition started by America’s founding fathers back in the 1700s. Stop into any of the pubs on the street Franklin Roosevelt called “the most historic avenue in all of America,” and you’ll imbibe in the very halls in which a nation was born. 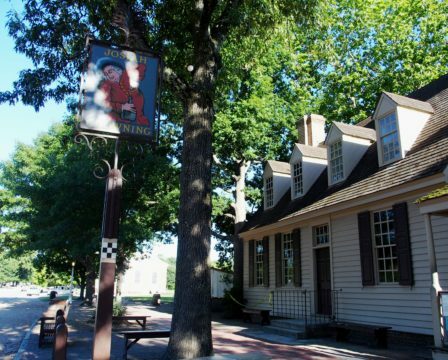 George and Martha Washington, Thomas and Martha Jefferson, Patrick Henry, and James Madison all rubbed elbows, spun stories, and planted the seeds of a revolution at these taverns located on a road named after the heir to the English throne. This avenue not only became a hub for business and hospitality, but also America’s second ever university, and the future site of Virginia’s capitol building. Thanks to the Colonial Williamsburg Foundation preserving our storied past, you can raise your glass at the same watering holes graced by the men and women who fought for America’s independence. Let’s stroll down Duke of Gloucester Street and see what they’re pouring, eating, and singing today. Perhaps the liveliest roadhouse on any given night in Williamsburg is Chowning’s Tavern. The black and white checked symbol under their sign notifies patrons that Gambols are permissible here. While drinking apricot brandy from an actual punch bowl or savoring a glass of Old Stitch brown ale, a Gambols sign signifies the favorite games of the 18th century. These pastimes may involve dice, sleight of hand, or at least a raucous song from one of the in-house balladeers. The hostess will request your full name before entering the genteel King’s Arms Tavern. That’s so you can be addressed in formal Mr., Mrs., or Ms. fashion. The King’s Arms is a step back in time affair, complete with employees wearing authentic era garb, a dining by candlelight atmosphere, and menu offerings that feature signature 1700s fare. Popular lunch or dinner selections include Pottage Pye, Chop of Shoat, and Peanut Soupe. Long before women’s suffrage, the glass ceiling, or Shark Tank, there was Christiana Campbell. 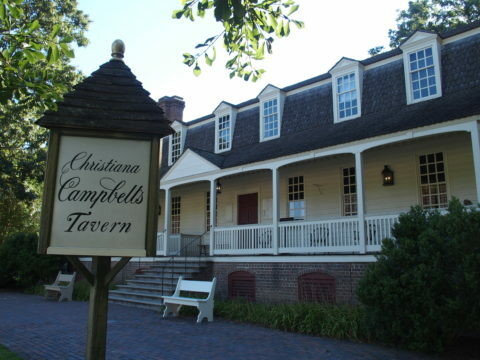 After her husband died in 1755, Campbell opened a tavern to support herself and her two daughters. George Washington and Thomas Jefferson were among Christiana’s clientele. Washington especially loved the tavern’s seafood. In line with this tradition, today’s Waterman’s Supper features clam chowder, stuffed flounder, a crab cake, and grilled shrimp. 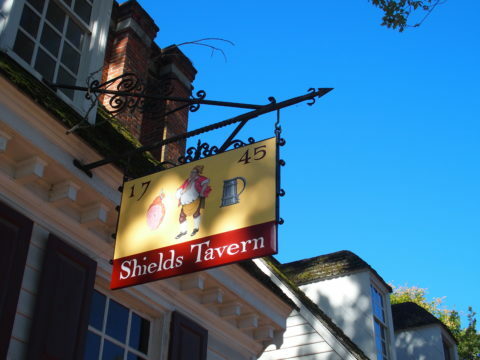 You’ll notice a building on Gloucester Street called Shield’s Tavern. 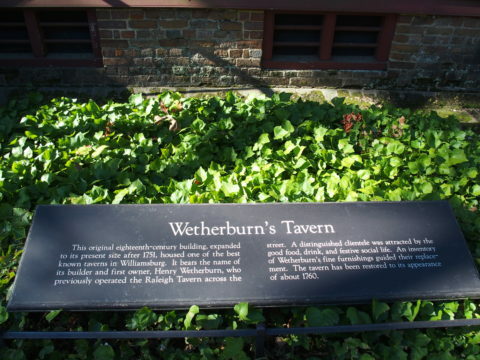 Look across the street and you’ll find Wetherburn’s Tavern. In the mid 1700s, these taverns formed a merger that was born out of death, marriage, and convenient “DOG” (Duke of Gloucester)Street proximity. When Anne Shield’s husband died in 1750, she married Henry Wetherburn, the tavern keeper residing across the road from her husband’s drinking and lodging establishment. After marrying Anne, Henry now operated Wetherburn’s and Shield’s. 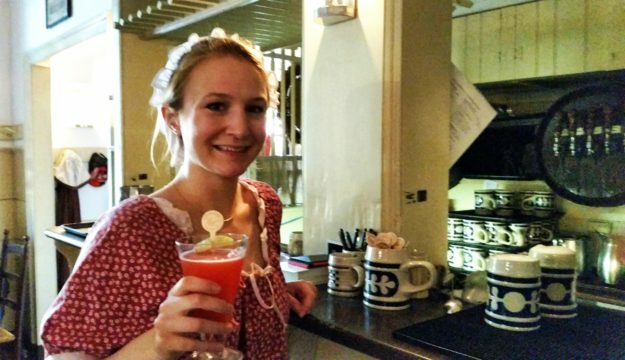 When Henry died shortly thereafter, Anne took over as innkeeper, barkeeper, and woman about town. You should note that Wetherburn’s is one of several Williamsburg establishments thought to be haunted. Apparently the ghosts of revolution past were not fond of the grape. This assumption could be made after Wetherburn’s was renovated in 1968. During the restoration process, 50 wine bottles filled with cherries were found in tact and buried under the site’s foundation. Walking Gloucester Street is like living in a time capsule. Each building has a story reflecting how different life was back in the days of the revolution. An inn guest reserving a night’s stay at a 1700s Gloucester Street tavern could expect to share a bed with an equally weary complete stranger. Anecdotes like this accompany every Colonial Williamsburg structure. 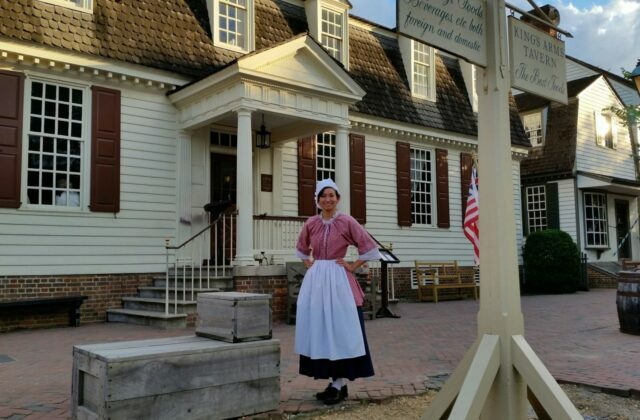 While attending to your food and beverage needs, well researched employees at Chowning’s or King’s Arms gladly share tidbits on their historical counterparts, their place of employment, and the history of Williamsburg. 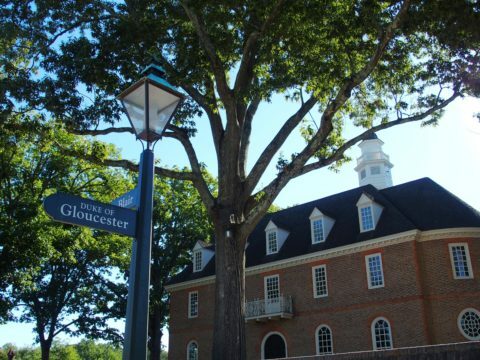 Visit the taverns on Gloucester and you can’t help but connect with the Washingtons, Jeffersons, and Campbells of the day.